Just inside Monk Bar is a small lane leading under an arch. 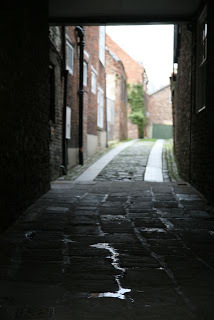 Today it is called Monk Bar Court, but in the 16th century it was known as Elbow Lane. All householders in the city were required to keep the street in front of their properties clean and swept of dust, dirt, rubbish, animal droppings and anything else that stopped the road looking neat. These ‘sweepings’ were taken to the nearest midden, which for the inhabitants of Monk ward in 1575 was in a garden in Elbow Lane owned by Thomas Barker. Far from objecting to having a midden in his garden, Barker seems to have viewed it as a source of profit. The contents of a midden made for good fertiliser, and the neighbours had clearly objected that Barker making people pay for it. We don’t know why the civic authorities chose Barker’s garden as the site of the ward midden, but it is surely significant that Elbow Lane is right on the edge of the city, next to the walls. I wrote a whole thesis on rubbish disposal and it’s a subject that fascinates me: the notion of what is considered dirty or unwanted, and the point at which rubbish or dirt is excluded, can tell us a good deal about a society and its priorities. Hi. I am planning a social history walk for the York U3A on Public Health. It will include information that was in your very interesting article in the History Magazine. I will begin with the Romans and end with the slum clearances in the C20. Can you tell me where Thomas Barker`s house was in Elbow Lane? It has been a stopping point for me on other walks including the history of medicine and it is a hidden gem of York. Thank you for any help you can give. Mike. The records just say Elbow Lane, I’m afraid. I’ve always assumed that his house – or garden at least – was quite close to the bar, so that no one had to carry waste too far, either when adding it to the midden in his garden, or taking it away for fertiliser. So I’d imagine that it was in the first part of Elbow Lane, on the right – but I’ve got no proof of that, sadly. Your walk sounds great – what an interesting subject! Hi. Thank you for taking the time to reply. Thomas obviously believed in the philosophy of where there is mooke there is money. I have already covered certain aspects of Public Health when doing walks on Poverty in York, the history of Public Toilets, Cholera and even Education as the girls of The Mount enjoyed WCs in1867. The difficulty, as ever, is distilling and than converting my notes into a meaningful walk around York. One hundred years of the Tudors into two hours was a challenge but a bigger one awaits-the history of Hairstyles! That must be a first even for the ancient city of York. Your article is going to be very useful to me. Was it a one off or part of a series or the beginning of a book? Mike. Good luck with the history of hairstyles. I imagine that, as with rubbish – or anything – once you start to look at how and why hairstyles have changed, you are overwhelmed with interesting information! Hi. Well thank you again for replying and giving me the link. There seems to have been a continuous battle to stop people depositing filth straight into the streets or church yards instead of the designated spots or middens. Keeping the sewers and ditches clear was another problem but when clear, it all ended up in the River Foss and there were also the pigs! What would a hot summer`s day have been like in York? I have just done Entertainment in York in the C18 and the fashionable people started to leave by the 1770s to a much cleaner and fresher Harrogate. Pity about the book because I would have bought a copy. It is amazing what comes your way as you get into a topic. I would never had guessed that I would become a big fan of the Gibson hairstyle of the turn of the C20. Many thanks again for your help and I hope all your research is successful and profitable. When my Public Health walk is up and running you are most welcome to join us. I am sure my group would like to hear from a proper historian and how you conduct your work. Very kind regards. Mike.